The advent of technology in education has created a renewed interest in personalizing learning and providing teachers with the tools necessary for differentiating curriculum. Early efforts to use technology to personalize learning generally began with a focus on basic curriculum competencies and more efficient procedures for text consumption. Now, rather than covering material in a lockstep fashion for all students at the same time, teachers can direct content at different levels to students according to their varied achievement levels. Although this use of technology extends by a giant step the traditional one-size-fits-all instructional model, it only accounts for varying competency levels leading one commentator to refer it as “Gutenberg-on-line—the electronic shuffling of worksheets and standard text material.” A similar case can be made for the explosion of on-line courses currently available to school age students. These courses have great value when not available locally, but they almost always follow a linear sequential instructional model rather than a more inductive and investigative mode of learning. A new program created with support from the University of Connecticut Research and Development Corporation has taken steps to extend the concept of personalization by measuring a broader range of student characteristics and focusing on engagement and enjoyment in learning, which has resulted in improved achievement. The program, called the Renzulli Learning System (RLS), is based over thirty-five years of research on cognitive development and whole child research can best viewed as a tool that can be applied to all curricular areas and grade levels. One teacher, interviewed in a research study (Field, 2009) dealing with this tool for high engagement in learning said, “It easily improved my student’s enthusiasm, enjoyment, and engagement as well as the scores on their achievement tests. It was like having a dozen teaching assistants in my classroom every day, all day!” RLS includes four steps, and an overview of the system is presented in Figure 1. The first step consists of a computer-based diagnostic assessment that creates a profile of each student’s academic strengths, interests, learning styles, and preferred modes of expression. The on-line assessment generates a personalized profile that highlights individual student strengths and sets the stage for step two of the RLS. The profile acts like a compass for the second step, in which a differentiation search engine examines thousands of resources and selects a personalized group of from 2000 to 3000 resources for each student based on his or her profile. Teachers can use information from the student profiles to create groups of students at various achievement levels or who share common interests or learning styles. They can also design instruction based on identified interests or learning preferences, send assigned curricular activities or projects to be completed independently or in small groups, and create pre/post assessments for evaluating student work. Parents may also access their child’s profile and web activities, promoting at-home interest in learning and parent involvement. These resources are not merely intended to inform students about new information or to enable them simply to surf the web. Rather, they are used as vehicles to help students find and focus a standards-based topic or explorations of personal interest that they might like to pursue in greater depth. Many of the resources provide the methods of inquiry, advanced level thinking and creative problem solving skills, and investigative approaches that are consistent with the current emphasis on 21st Century Learning Skills. Students are guided toward the application of knowledge through the development of class-related assignments, original research studies, creative projects, and action-oriented work that applies knowledge to personally meaningful areas of interest. All resources in the database are classified and cross-referenced by subject area, state or national standards, critical and creative thinking skills, and grade level. The database includes resources exclusively reserved for teachers’ use, assessments for each of the fourteen enrichment resource categories and lesson plans organized by subject area. Teachers can selectively send differentiated assignments to individual students or targeted groups by simply clicking names or pre-established groups on the class roster. The resources available in step two also provide students with places where they can pursue advanced work in their strength areas and areas of personal interest. Evaluation vehicles are built into the system and teachers can provide feedback face-to-face or electronically based on student performance. The third feature of Renzulli Learning is a project organization and management plan for students and teachers called The Wizard Project Maker. This e-guide enables teachers to help students use their web-based explorations for class-related work and original research. Specifically, the Project Maker provides students with the meta-cognitive skills to: define a project and set a goal; identify and evaluate both the resources to which they have access and the resources they needs (e.g., time, Internet sites, teacher or mentor assistance); prioritize and refine goals; balance the resources needed to meet multiple goals; learn from past actions, projecting future outcomes; and monitor progress, making necessary adjustments as a project unfolds. The Wizard Project Maker establishes a creative and viable responsibility for teachers in their role as “the guide on the side.” By helping students pursue advanced levels of challenge and engagement through the use of the Wizard Project Maker, students see teachers as mentors rather than task-masters or disseminators of knowledge. The Total Talent Portfolio “travels” with students throughout their educational career, as storage of previous activities and creative accomplishments that they might want to include in college applications. This ongoing record that helps students, teachers, guidance counselors, and parents make decisions about future educational and vocational plans. 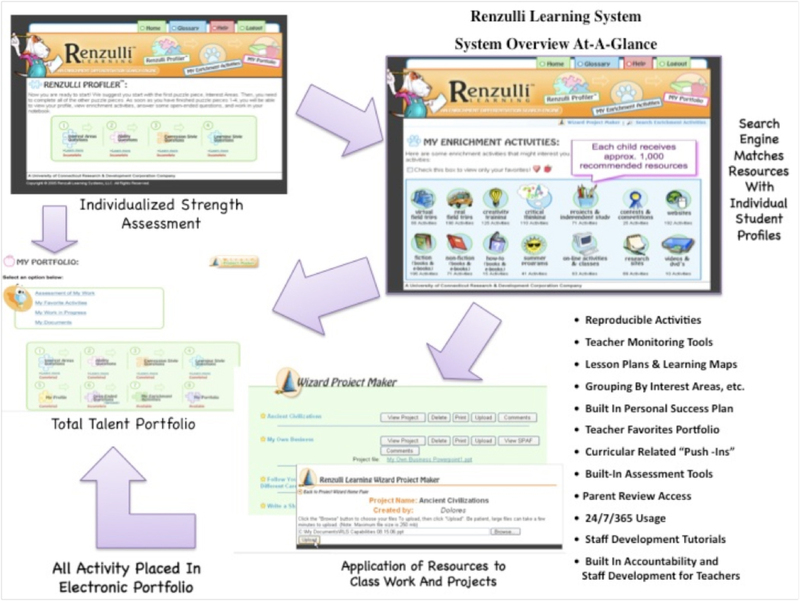 The Renzulli Learning System is designed to help busy teachers personalize student learning by enabling them to address individual differences, diverse student needs, and increased pressures to improve student achievement. The proprietary search engine technology guarantees resource match-making and personalized learning. This approach extends far beyond Guttenberg-on-line by providing teachers with an easy-to-use research based tool that can be applied to all classroom situations. Simply stated, the goal of the RLS is to increase achievement by capitalizing on high engagement and enjoyment of learning, two research proven components of effective schooling. Interested readers can examine the RLS by going to http://www.renzullilearning.com and clicking on Test Drive Renzulli Learning. Field, G. B. (2009). The effects of the use of Renzulli Learning on student achievement in reading comprehension, reading fluency, social studies, and science. International Journal of Emerging Technologies in Learning (iJET), 4(1), 23-28.